There is a reason that the Gentle Art of Swedish Death Cleaning made such a splash in American culture: a significant portion of us either receive or will leave a lifetime’s worth of possessions for someone else to sort out. The main challenges of decluttering when someone you love has died are threefold. First, in the state of grief and loss, it’s really hard to untangle our desire to feel connection to that person with wanting to be surrounded by their stuff. Second, it can be overwhelming for anyone to declutter their own lives. When you add another person’s stuff on top and it can feel impossible to know where to even begin. Third, we know the stories of our own things and that can lead to us being attached. But with our loved one’s belongings sometimes we won’t know what things are or if our loved one valued them, so we will assign value and importance to everything. If you or someone you care about is dealing with this now, please know we are sending you a big hug, that we are so sorry for your loss, and that we believe in your ability to both honor and cherish the memory of your loved one while living in a space that feels light, calm, and supportive to you. I’ve been thinking over this subject a lot but it was a question that came in from a reader that inspired me to get this is all out. Below I’ve included a version of the question (removing any personal details for the sake of anonymity) we received and my letter in response. Decide if you’re at a place in your mourning and grief where you are actually ready to begin decluttering. It’s ok if you aren’t. Be kind to yourself and take your time. Start with your own belongings. This really serves as a warm up. A chance to experience decluttering in a less emotionally challenging area. Choose a few of your favorite, most treasured items of your loved one. Give these items places of honor in your home and display them in a way that brings you joy and helps you feel connected to your loved one and their memory. Move into an easier category of your loved one’s belongings. This will ideally be quite small and not emotionally burdensome, like: athletic shoes, tupperware, or office supplies. Go at a pace and scale that feels right to you. It’s important to stay within the bounds of what feels safe and good to you, and to give yourself a break if you stumble upon something emotionally complicated when you’re not expecting it. Select an organization (or several) that were meaningful to your loved one or to you and donate their items there. Trying to sell belongings usually extends an already trying process and can feel invalidating when the financial value does not match our emotional experience of the object. Offer up a few belongings to any interested family members but don’t transfer the burden of decluttering to them or a future generation. This is one of the kindest things you can do for others. My aunt lived with me for 15 years and she passed away last year. I haven't been able to go through her closet and donate her things because it makes me cry. I also have china, crystal, and silver plate things that my aunt had and also inherited more from her mother and aunt. I also have a lot of craft items, fabric, and various other collections my parents bought me (they’re gone, too). My problem is I don't want to just give away some of these things because they are valuable, but in speaking with an antique dealer, those items aren't wanted. I have no other family so I can't give anything to relatives. I feel so overwhelmed with all my stuff I don't know what to do or where to start. I would follow your directions and start with wardrobe, but I can't do my aunt's clothes yet. Any advice? Thank you in advance for your time and expertise. First of all, I am so sorry for loss. It makes so much sense that sorting through your aunt’s belongings would be hard. So I guess I would start there, and just encourage you to be kind and gentle with yourself. What you're going through is incredibly challenging and unfortunately very common. We've worked with a lot of clients who've lost parents, spouses, and other family members and it is hands down one of the most challenging projects to undertake. I'd love to offer up a few pieces of advice or thoughts to mull over. The first would be: do you feel ready to tackle your aunt’s belongings now? It's ok to take your time and to process your grief and return to this later. If, however, you're feeling like you're really ready to make a change and just overwhelmed trying to determine where to begin, read on. To begin, I'd encourage you to start with your own possessions in a category that will be easy for you. This will be a place where you can get a few big wins, start to make a dent in the amount of stuff you have, and familiarize yourself with the process of letting go. For some people, this could be books (which could then be donated to the local library), while for others it might be kitchenware (which could be donated to an organization that helps to resettle refugees, houses those experiencing homelessness, or helps domestic abuse survivors). Feel free to start really small, like just with athletic shoes or scarves. Once you're feeling confident and starting to experience some benefits of letting go you can then make moves into more emotionally complex zones. 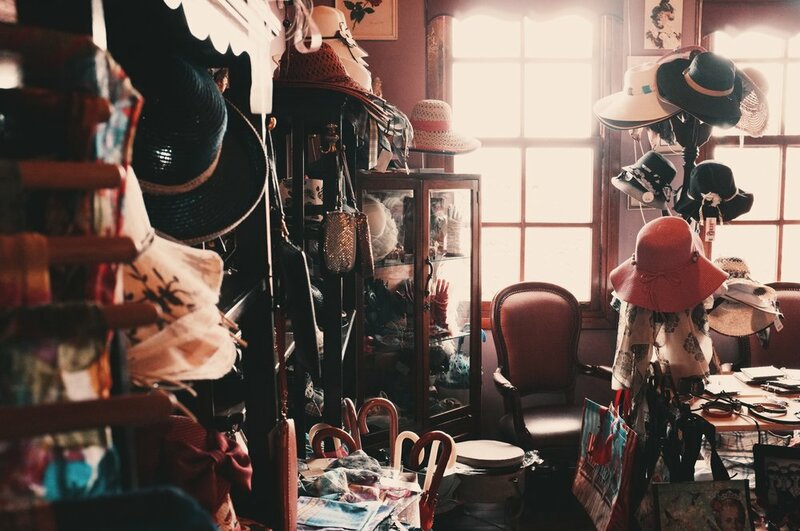 Before touching any of your aunt's goods, I'd go through and select a few really prized items that you love and remind you of aunt in a happy way. Maybe you'll display a small collection of her necklaces, or a frame a beautiful scarf of hers, or bring four of her best china teacups into your cabinets to use each morning. This will help ensure that your aunt's presence is felt in your home and will give you space to release more items. You could then move to a tiny category of your aunt's, like bracelets or slacks. Depending on how she liked to dress, those items could be donated to Dress for Success or a local Senior Center or Salvation Army. From there, you can expand into larger or more complex categories, always going at a pace and scale that feels safe and good to you. Usually decluttering gets easier and easier as you go along, but know that grief comes in waves and that you might stumble upon a really tender item when you’re not expecting it. Take the time to process your feelings and honor yourself if and when you need to take a break. In terms of the items that the antique dealer told you there wasn't a market for, I'm afraid my advice might not be what you are hoping for: let them go. It can be so hard when we've invested money into belongings to simply donate them, but the energy and time and emotional space we take up by trying to sell things at a fraction of their perceived value is ultimately far harder and less rewarding. Instead, I'd select an recipient organization that is important to you or to your aunt and know that these items will be utterly treasured and beloved by people who've not been fortunate enough to have such beautiful things in their life before. Again, I'd suggest one of several organizations that work on housing and helping to create stable, meaningful lives for the vulnerable among us. It might feel really hard as you prepare yourself to let these items go, but once they're gone I think you might be surprised by how much lighter (physically, emotionally, spiritually) you feel in your home. We’re here if you have any other questions or would like to work with us directly; many hands can indeed make light work.